Blog of a section of an introduction to the library profession course. Almost no library stands alone. The role of the academic library is to serve the mission of the system under which it has been created, which includes community colleges, technical colleges, junior colleges, 4-year colleges and universities. However, libraries and academic institutions existed outside of each other for hundreds of years. Though the actual dates are still debated, the first public libraries in the world were established in Rome during the 4th century but the first university, the University of Bologna, was not established until right before the year 1100. (Budd, 1998) That was followed closely by the University of Paris and the University of Oxford during the 12th century. At the time, the method of teaching revolved around a professorial lecture and student recitation, though sometimes a lecture would be turned over to the university to be copied and purchased by students. As more lectures were copied and more copies of older lectures were reproduced, a storehouse for these materials took shape. By 1338, what is considered to be the first (ancient) academic library, the library at Sorbonne (University of Paris), contained over 1700 volumes of lectures. According to the 6th edition of the Encyclopedia of World History, movable type in China and Korea dates back to the early 11th century, though the ideas were not used in the west until the mid-1400s when Gutneberg refined the system for aligning text and printing using oil-based inks. The proliferation of printed text meant, not just more having copies of the same lectures, but that new writings, secular writings, were available and could be included into the curriculum. As more writing became available universities saw the value in having books that could not be included into the course of studies. Sir Thomas Bodley, a benefactor of the University of Oxford took it upon himself not just to fund the library collection, but to travel the continent to buy books on many subjects. (Budd, 1998) By 1605 it was noted to have contained more than 5000 books and manuscripts. The number of universities aided by the advent of printing, continued to grow and their curriculums broadened, reflecting a rise in literacy and a trend towards scholarship. It was during this period in the colonies that Harvard University was established. In 1638 John Harvard donated £800 and 300 books to establish what we know as the first state-side academic library. In 1667 Harvard’s first librarian was appointed. Use of the library was limited to senior members of the university and the library was only open from 11 am until 1pm. (Budd, 1998) Access was limited as no catalog system existed until 1723 and even then they were usually arranged by size or donor. (Weiner, 2005) After the revolutionary war, some colonial universities saw a shift in curriculum, one that included the Enlightenment’s openness to science; those ideas were followed by the inclusion of literature and language studies, ostensibly, the arts. The perceived value of academic libraries grew along with the number of volumes, but there was no uniform system for classification until Melville Dewey began classifying books at Amherst College by decimal numbers in the 1870s. The ACRL continues to support the needs of academic libraries through, publications and committees, and by offering standards, guidelines, and advocacy, similar to the ALA. Guidelines focus on the issues of access, staffing and continuing education for librarians, information literacy and instruction, collective bargaining and funding, and special collections and archiving. For the full text of ACRL guidelines visit http://www.acrl.org/ala/mgrps/divs/acrl/standards/index.cfm. The current issues facing academic libraries today are similar for all types of libraries, they are ubiquitous in contemporary writings about libraries and mostly revolve around the affect that technology has had on libraries. The ACRL research committee has listed its “Top ten assumptions for the future of academic libraries and librarians” which almost identically reflect those issues in the Libraries Unlimited title, “Defining Relevancy: Managing the New Academic Library”. The ACRL list which can be found here: http://www.acrl.org/ala/mgrps/divs/acrl/publications/crlnews/2007/apr/tenassumptions.cfm) includes the digitization of collections, electronic access and the subsequent privacy and intellectual property issues, competition from online search engines, information literacy, value added services for the “new” student and faculty including distance education students, and the education and skills needed by today’s librarian to address these issues. As students see themselves more as customers of the library, the academic library of today is shifting towards a model usually seen in world of for-profit businesses. The role of academic libraries is shifting from providing the collection, to a the library as a destination. . .a place for studying, a place for research, a place for meeting, a place where students and faculty consume information. For today’s academic library to keep adding value to itself and to its host institution, it must continue to evolve to meet the comforts and demands of students who have a sharp sense of the world as a global community and who want to experience that from the comforts and conveniences of high-speed internet, WiFi, plush chairs, and the instant messaging gratification that they find everywhere in modern society. Budd, J. (1998). The Academic Library: Its Context, Its Purpose, and Its Operation Englewood: Libraries Unlimited. Hurlbert, J. M. (Ed.). (2008). Defining Relevancy: Managing the New Academic Library. Westport: Libraries Unlimited. It's interesting to see how academic libraries have evolved. I know plenty of schools that have upgraded to the "plush chairs" and fancy decorations. I think it's kind of entertaining, because I think even with those upgrades, many students would still choose to go to a coffeehouse or a Barnes & Noble, no matter how posh the library is. I'm not sure that I would use library funding to update furniture and such. I feel like students should come to the library to study in a focused environment, not necessarily to be entertained. I just don't see the library becoming a hangout spot, no matter how decorated it is. I agree with Holly. In fact before I saw her post, I was going to say the almost exact same first sentence she has! It is certainly interesting how things have changed with academic libraries. I don't necessarily see libraries as a Barnes & Noble type place, but I can see how technology and integrating the cofee house feel has improved use of the library. As far as the library becoming a hangout spot, I think it depends on the school. At my undergrad, the library was a happening place . . . it definitely had a social aspect as well as an academic one. I think it's important for libraries to think of academic libraries as place, but also as virtual place. We did an extensive survey of our college library patrons last year, and 50% of them rarely set foot inside the library building. However, they still use library resources; they just choose to do it electronically. They are still our patrons and are still using our services. I think it's essential to develop a concept of your library's virtual place as well and to work on making that as inviting and user-friendly as your physical space. The topic of "competition"comes up frequently in writing about academic libraries. Competition with coffee shops, bookshops, and since we can access many of the same databases. . .home. So, academic libraries and many other types of libraries are trying to add those types of creature comforts, for better or for worse, *and* different types of value added services. I interviewed the Director of the UM Law Library last week as part of my library visit project and she was totally fine with the fact that students can successfully complete a JD without having to ever step foot in the library, but still understands that there is a very real need to add these types of comforts and services as a way to attract not just students, but faculty as well. Of course, the UM Law library has a huge endowment and according to her, is not very concerned about funding or the "value" of the library as seen from the eyes of the administration. But, the library remains the only place that combines function and form, and services to "encourage-deep thought." The college where I work is in the silent phase of a campaign. 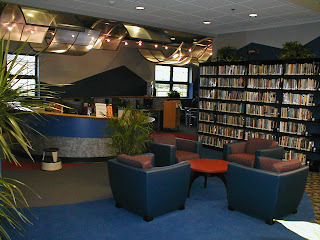 One of its iniatives is to exapnd the library's electronic resources. In May, I attended a meeting where the library director talked about how the library must rely on other libraries in its consortia to provide articles and other materials to its students because the library's own collection is not that extensive. The director told us that usually the students have to wait about 24 hours to receive a copy of an article if the library doesn't have that particular resource. This news is not usually received well because, as you noted in your post, today's students feel entitled to have their information now. I think comfortable, cozy libraries attract more students. I think the programs offered add to the attractiveness of the library, too. Earlier the libraries were the places where the patron can access books and electronic materials. Nowadays the electronic access is available to the patron from anywhere – home, dorm or desktop -but the library is convenient and congenial and comfortable place where there not only access the material but also have group studies and discussions and interact with fellow patrons. More so because the academic programs are now becoming more group oriented and library oriented programs. I-commons is now becoming more popular in most major academic and research libraries. Intellectual Freedom: What About Filters?